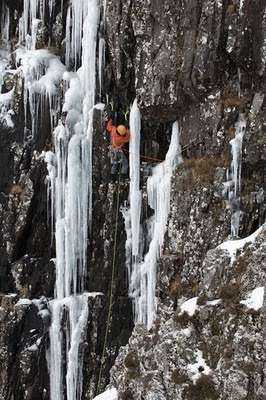 Glen Coe - Ice Ice Ice!!! A couple of new things in my shop this week. 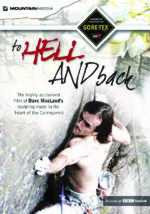 First off the BBC TV film To Hell and Back about my first ascent of the E10 on Cairngorm has finally been released on DVD by Triple Echo, after many requests. Some of you will have read about my preparation and eventual rather nerve wracking lead on this blog, but didn’t get a chance to see the film on Scottish TV. The climb is still the UK’s only E10 graded mountain rock climb and one of the most serious trad routes anywhere. In the film there’s a fair bit of me getting really quite scared, belayers reduced to tears and even the film crew saying on camera that they wouldn’t film something like it again. You can get a copy here. Enjoy. 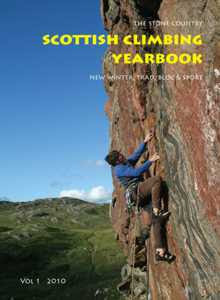 Next up is Stone Country’s new annual book production the Scottish climbing yearbook. I’ve just read through it and feeling roundly inspired for next year’s climbing action. 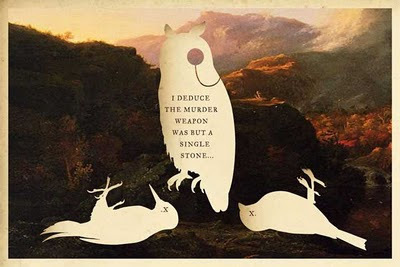 Congratulations to John Watson for a superb concept of a climbing book. The yearbook idea has been tried on a world scale, but doing it on home turf works much better - all the new crags in the book are places you can jump in the car and go to. All the climbers, crags and mountains pictured gloriously in full colour are ones you know, or soon might. This adds a new level of relevance, and hence inspiration. A great reminder of what we have in Scotland and what others are getting out and doing. Just what is needed as we start a new year of climbing. In it you’ll find news of highlight ascents sumer and winter, excellent large photos of places and climbing action and topos of new, established or rapidly developing crags that haven’t hit the guidebooks yet. It costs less that buying two issues of a climbing magazine but has more stuff that means something to you than a whole year of magazines. It’s here. A lot of life seems to go like this - adding more new things to do, but not removing anything. So there is less and less time. Work counts as one of those things that ‘has to be added’, especially if you are self employed. Time for family, friends and leisure (in my case climbing) counts as one of those things that ‘has to be sacrificed’. Too many sacrifices in a row create a bit of a crisis. And for me, thats what’s happened now. Over the past three or four years, I’ve worked more and more and more. And every piece of added work has made me less happy. Thats not to say I don’t enjoy the work. I enjoy all of the things I do. But not the balance of them. There’s just too much of one ingredient thats blotting out everything else. Bit of a mess. So now I just cannot continue at this pace of getting up and working straight through to the wee hours every day of my life, trying to fit in training and life on the end. Along the slide of this slippery slope I’ve forgotten what options I have for replacing new activities for old, rather than just adding, and generally fitting everything in better. Like any big and deep change I’m going to have to be pretty firm about it. I’m hoping it follows the pattern of other really important changes that you know are the right and necessary thing to do; the hardest thing to initiate the move and the easiest thing to finish it. Those of you know know anything at all about winter climbing in Scotland will know instantly what I’m talking about just from the title. In 1960 Jimmy Marshall and Robin Smith climbed 6 routes on Ben Nevis in one week that were all cutting edge at the time. 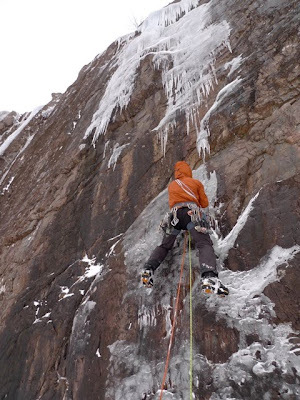 Some of them were first ascents such as the famous Smith’s Route (V, 5) but the others like Point Five Gully were done very much faster than previous ascents. 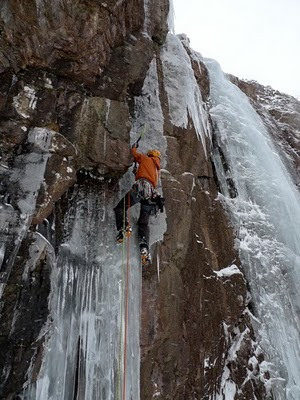 The week has been a bit legendary ever since as pretty much the finest achievement in ice climbing using the step cutting technique and a formidable display of mountaineering skill and fitness that was not surpassed for man years or even decades. Anyway, It’s 50 years since the famous week next month, and myself and Andy Turner will be trying to repeat the week as away of marking it personally and on film. It’s something that a few of us in Lochaber had been talking about doing for a while, but Mike Pescod from the Fort William Mountain Festival really galvanised us into action over the past few weeks, roping in Diff from Hot Aches to film us during the week and arranging for us to talk at the festival after the week about our thoughts on it and it’s importance as a great story and achievement in Scottish winter climbing. There is more on it on the FWMF’s page on it here. 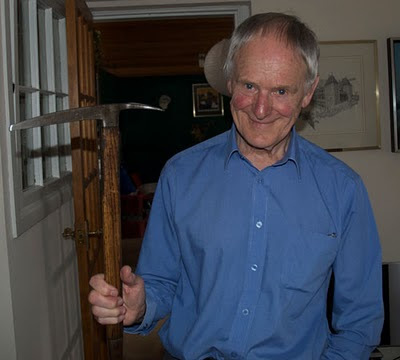 But our plan is to climb the 6 routes on Feb 6th-12th, repeat the Grey Corries traverse as Smith and Marshall did for their ‘rest day’ on the 13th and talk about it on Marshall night at the festival on the Sunday night (14th) where Jimmy himself will be making an appearance. I’m not so sure if we’ll repeat the theft of the Fort William pub’s set of Draughts and ensuring arrest by the polis, but we’ll see ; ) All very exciting. 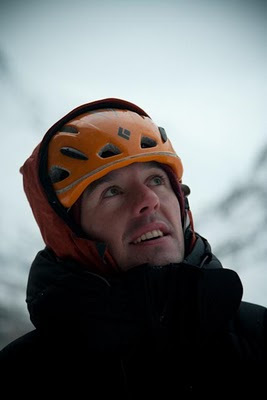 Andy Kirkpatrick is on at the FWMF on the Friday night (12th) and Diff’s lecture on Sat 13th is called ‘Climbers I’ve shot and some I’d like to shoot’ which I’m hearing is a good laugh. See y’all there. Andrew points to Climb Swaziland which is a cool looking project helping kids without too many opportunities in Swaziland to get into climbing on Swazi sandstone! 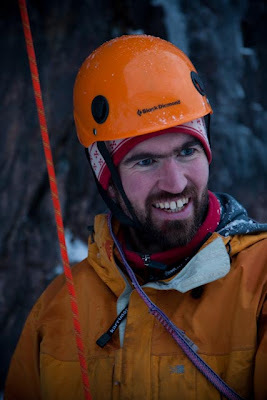 They are looking for climber’s used gear to help them make it happen and support in other ways. They also have some info and topos on the climbing around there. Check it here. I’ve just written an article discussing in a bit more depth my psychological preparation for Echo Wall on PlanetMountain.com here. 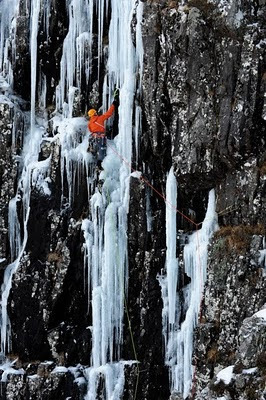 EICA Ratho 4th February - masterclasses during the day and a lecture in the evening. Fort William Mountain Festival Sunday Feb 14th - talking about the Marshall/Smith week re-enactment. Llanberis LLAMF March 6th lecture and masterclasses the following day. Details of all those lecture on my lectures page as always. 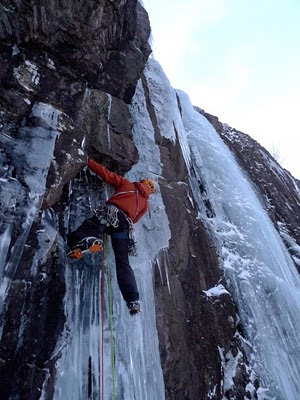 It’s been a good week - five new ice routes in Glen Coe in one week, and all superb quality. 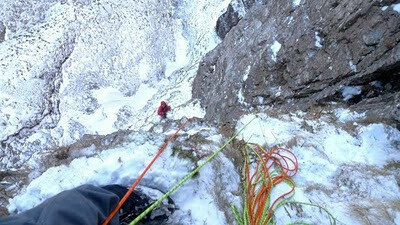 A rare set of circumstances in Scottish winter climbing when conditions, partners and time off work coincide. I can now get back to a massive backlog of work with the nice feeling of some memorable climbing done. Today was another lie in till 7 and stroll up to the Lady Jane wall with Blair to look at the left hand overhanging groove. It had looked like by far the hardest project on the wall and potentially VIII or harder. As it turned out the ice and and a few opportunities to bridge were more useful than anticipated and the line went at a short but still pretty tough VII,8. Definitely feeling fitter and more confident in my movement over snow and ice right now and keen to get on something hard. 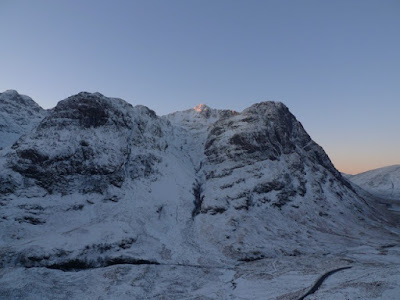 Steven Gordon sent through these pics from today in Glen Coe. It was good to have Steve’s company on the hill again today for the first time in a bit. Steve and I have had many good days in previous seasons while Steve was out taking pictures (and often holding my rope too!). A man with as many irons in the fire as Steve always makes a good blogger. He’s just started his occasional photojournalist blog with more pics of this and other recent outings in Scottish Winter. All these pics copyright Steven Gordon. 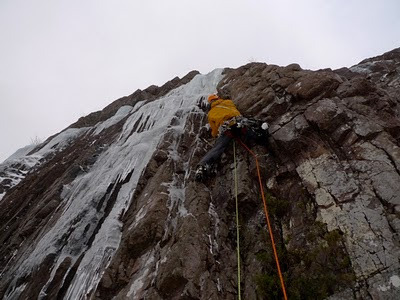 Last week with Donald I’d spied some desperate looking but amazing steep ice smears on the Lady Jane wall on Aonach Dubh in Glen Coe. Exactly how ice climbers dream of thin ice face routes could be - ice smears a few mms thick and occasional blobs running boldly up a wall, eventually gaining ever-thickening ice to finish on an overhanging pillar. 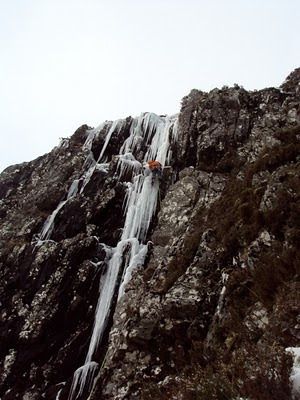 And so today we had a bit of a desert island ice route day. 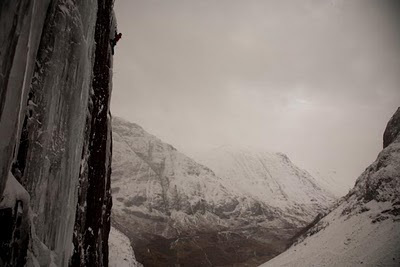 First off Blair romped up a steep crack and ice pillar on the right side of the wall near Blast Off at VI, 7. Then I looked at the smears running down the centre of the wall from Lady Jane. (a summer E2). 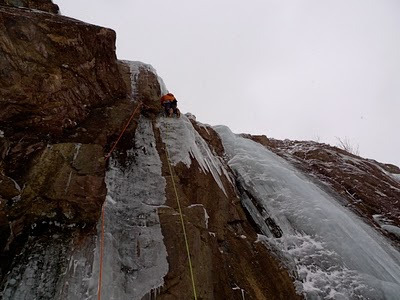 Some bold and thin but excellent climbing eventually led to some good rock gear at half height and then the rest was pure enjoyment on perfect grade VI ice. I’m not sure whether it was VII, 8 or VIII, 8. But on reflection the crux seemed definitely harder and bold as Viva Glas Vegas which is VIII,7. I’ve always seen VIII as a ridiculously hard grade, but there a lot of steady VIIIs these days. It doesn’t matter in this case anyway. Perhaps it just scraped into VIII today, but another few mms of ice and it would be fine. 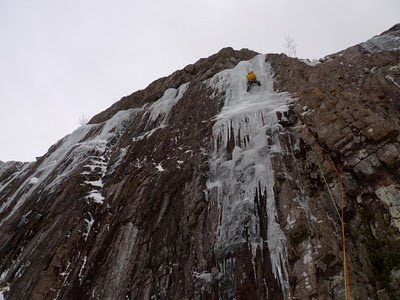 Along with The Shroud on Ben Nevis I can’t think of a nicer ice route I’ve done anywhere. Finally, after several weeks of lethargy, illness and generally feeling like a sack of potatoes, my body seems to have shaken off whatever lingering virus I’ve had. My energy I’m always paranoid of losing has come back, and I feel much better for it. Every time I wear myself down a bit I’m always really scared I’ll not come back from it. And in the moment of the downer time seems to go awful slow. Eventually though, the body responds to good treatment and I feel quite good now for another good challenge. Writing my book has been a bigger drain than I expected. 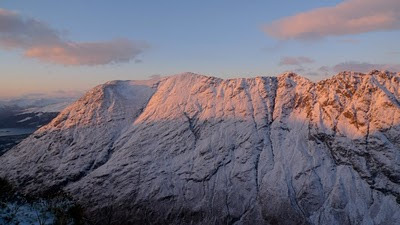 I’m still kind of waiting for conditions and partners to fall into place for a look at my project on Ben Nevis. 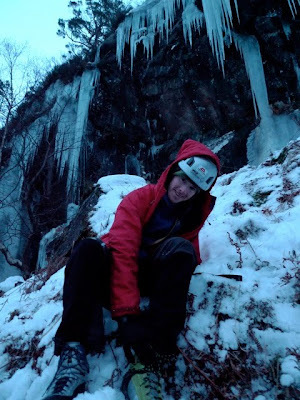 I’m feeling like I’ve done enough easy routes now to have learned how to stand about in crampons and swing tools again. I’m ready for a shot now, and just want my chance. Kev Shields somehow still smiling despite a mashed ankle and a lot of pain. He’d just fallen out of the cave above the ice pillar behind and stopped where he’s sitting!! Climbing hanging fangs of ice is dangerous. Tread carefully. I broke this chunk off with the slightest of touches. 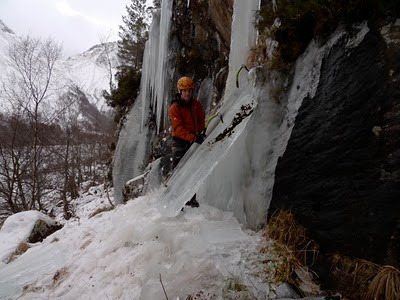 Kev had been talking about some impressive steep bits of ice he’d been eyeing up in Glen Nevis over the past couple of weeks. So we finally made a date to check them out. 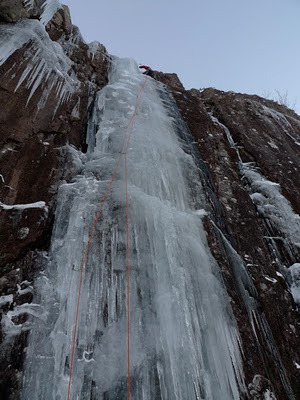 After a nice solo ascent of one lovely fall (in the background behind me above) I belayed Kev on the most impressive line, connecting two exciting looking pencils of ice. Kev moved up the first with good commitment and got a piece of gear in a cave below the second. But with the temperature reaching a dizzy +3 it no longer seemed a good idea to go swinging around underneath a ton of suspended ice daggers. Unfortunately, retreat didn’t prove the safest option this time. 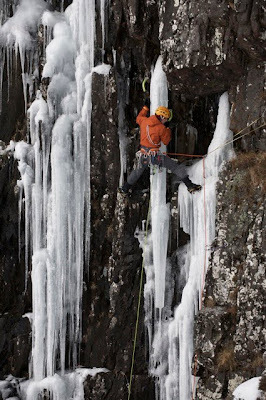 I’d lowered Kev about a foot on the rope when the gear suddenly ripped and he plummeted, pile driving straight into the floor fifteen feet below on flat water ice and heading off down the slope below. He came to rest silently, lying on top of his prosthetic ice axe which had thankfully not entered his chest! However, he was less than perfect shape with a suspected broken ankle and eyes rolling around in his head with shock. We didn’t waste any time and while Gaz shouldered our three packs, I shouldered Kev and made haste down Glen Nevis on foot to my car back near lower falls. 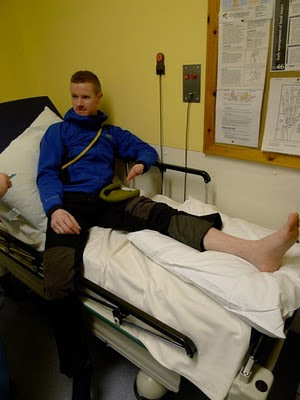 Thankfully no break for Kev, just a diagnosis of a lot of foot-off axe training for some weeks. 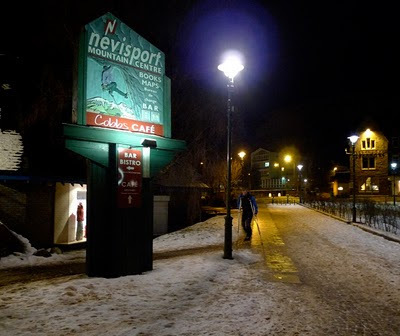 But it was decided that steak pie and a pint in the Nevisport was a fitting way to cheer the injured party up before the rehab commences. I see an apprenticeship in ‘the shire’ is clearly pretty good for handling pain without getting too worked up. Hardly a wince from the man despite being carried a farmers mile on my back with me slithering about on the ice and bashing a very messed up ankle. Good effort. I’d rather not see anyone hit the ground again for a while. It’s not very nice. Frozen Assets takes the right hand line, moving between the ice dribbles. 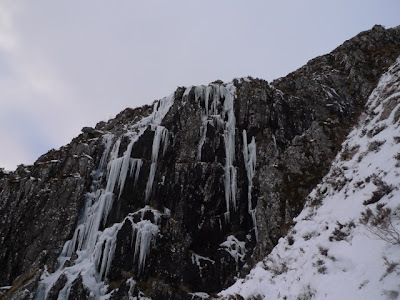 I went back to the the Coe with Sam Wood to revisit the crag right of the Slit where I’d done the brilliant new ice route with Donald the day before (Liquidation VI,6). Our goal was to climb the rather steeper and thinner series of dribbles, pencils and hanging fangs to the right of that route. 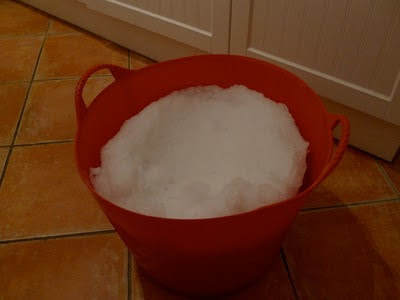 Our water supply at home for the time being - a bucket of snow. After our drainage system giving in a couple of days ago, now our water supply (which comes of the mountainside behind the house) has finally frozen up. Attempts to revive the system involving ice axes, flasks and a blowtorch this morning failed miserably against vast quantities of ice in the feed tanks and pipes. It seems we’ll be melting snow until whenever the gulf stream gets it’s act together and blows away the Scandinavian high thats causing all the icy trouble. 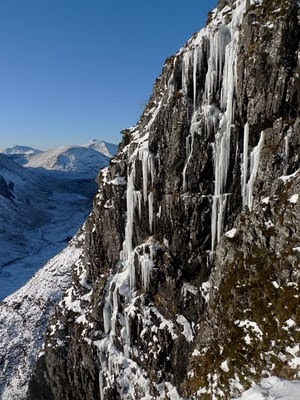 Donald mentioned some steep bits of ice that had formed nicely right of the slit on the Aonach Eagach side of Glen Coe. 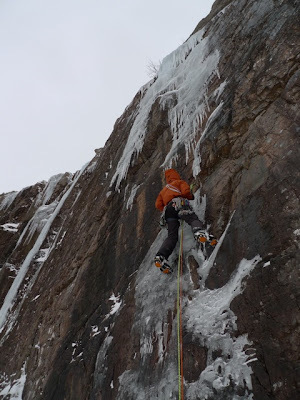 This morning we strolled up some nice unclimbed icefalls to the foot of a wall of hanging fangs. It was pretty baltic in the katabatic winds of first light and -13 at the car. 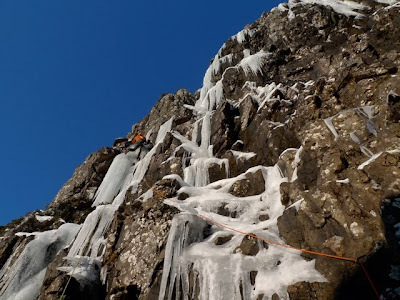 But things soon warmed up nicely in the strong January sun, and I was eager to get to the top of the pitch before fangs started to drop from the sky above us. A brilliant pitch of VI,6. We climbed the left hand icefall of this wall. Back at the car Donald spied that the Excellerator was looking formed on Aonach Dubh, so we threw our boots back on and fired up to that and Donald made a fine lead despite a nauseous bout of hot aches and some nasty dinner-plating in the cold temperatures of the north face shade. It’s been an interesting time over the past couple of weeks for me. 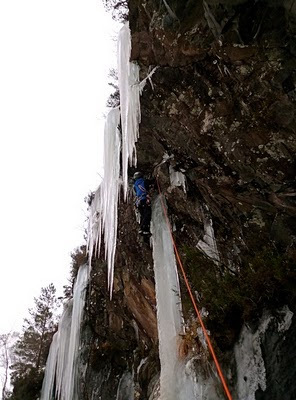 I’ve been mainly ill and unable to climb, which is weird during our little arctic blast here in the highlands. I’ve managed to get out and do a few easier routes as these have been in the best condition and I’ve wanted to do that anyway to get into the flow of climbing smoothly on mixed terrain again. I did have one nice day out in Glen Coe with Ian Parnell. We did Against All Odds (a grade VII). It was one of those days where there is only snow on ledges but not plastered everywhere. It was interesting to do a route in that nick again. I had in my my mind a massive discussion I has at the foot of Sassenach on Ben Nevis with Tim Emmett and Will Gadd a couple of years ago. It looked acceptably snowy from the approach and everything else on the mountain was too dangerous to get to. But standing at the foot of it and looking up there wasn’t much whiteness to be seen. Will thought we (Scots) were completely mad for passing up a good route for the sake of a couple of bits of white fluff stuck to it, that we scrape off again anyway. Tim was not far behind (in the end the turf wasn’t frozen anyway so they didn’t do it). I had maintained that it was indeed important that the routes were at least reasonably wintery because that helped to make it a richer battle. 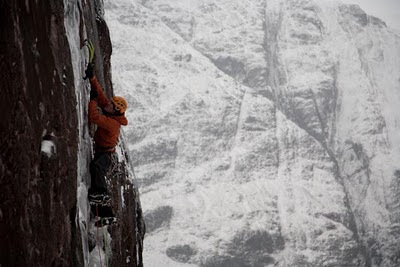 It’s the whole experience that makes Scottish winter climbing ‘something else’. So this time we strolled up Against All Odds with no problems, and sure enough, it was nice but not memorable for the climbing really. Anyway, after that and another few days of trying to get healthy again and doing some messy jobs at home involving septic tanks, I’ve been preparing to get back out on mountains. I’ve had a nearly constant battle in my mind to devote my time to climbing whatever seems a good idea at that moment, or the big project. It’s so true that you have to sing in your own voice to experience the strongest rewards, but at different times I love both approaches to climbing. I spent the summer doing easier routes quickly like Present Tense and Durorband. But as the project guru Nick Dixon always said, the ‘need’ comes around for the big project. And so after one more day tomorrow of doing easier things and just swinging tools into ice, I’m declaring it time to apply tunnel vision for the project and start venturing up the Ben Nevis path again for the season.